Since being released in a blaze of glory along with iOS 5 back in October of last year, Siri has been a mainstay in the tech headlines. Unfortunately for the majority, Apple’s system-wide voice recognition software was only officially supported on the brand-new iPhone 4S – leaving some iPad, iPod touch and owners of older iPhones feeling a little underhanded. The fruit company maintained that the specifics of the iPhone 4S hardware rendered it the only device capable of handling Siri, but we of course suspected it was simply a ploy to bolster sales of the new device which otherwise, would have been pretty unremarkable. Regardless, devs got to work on a variety of Siri clones, allowing users of the older iDevices to enjoy the perks of the audibly-prompted assistant. We’ve compiled a list of the very best of such applications, enabling you to enjoy a Siri-like experience whether you have iPad 2 or an iPhone apart from the 4S. One of the newer entrants to our shortlist, Speaktoit (speak to it) brings more than voice commands to those unsold by the much-hyped iPhone 4S. 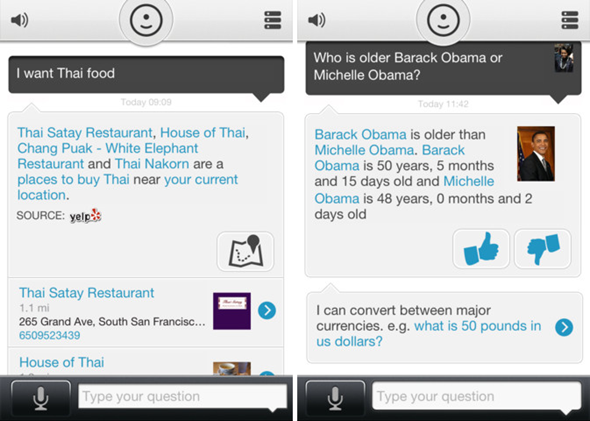 Users have the ability to add a custom avatar to the voice, which is a big deal compared with the small, unremarkable purple microphone icon of Siri. Speaktoit is a lot more than a cosmetic advance on Siri, though, and if you’re an e-socialite, this may just be the perfect Siri clone for you. On Apple’s version, you can use Siri to post those all-important updates to Twitter and Facebook, but if you aren’t lucky enough to be on an unlimited text plan, you’ll find your monthly SMS allocation is eaten into – quite considerably if you’re a power user. With Speaktoit, there are no such issues – simply log in, allow access and you’re good to go. Sure, any Siri clone will have its work cut out trying to overthrow the efforts of Apple, but it’s legit – and you needn’t take our word for it. Download Speaktoit right now from the App Store, for the reasonable price of $1.99 and test it out for yourself. Additionally, we have a feature-length article regarding Speaktoit which you can find here. This personified Siri alternative was featured here at Redmond Pie a few days ago. Very similar to the real deal, it purports to offer a lot more than the fruit company’s version. After extensive testing, it is a great solution, but the response times are sluggish at best. Furthermore, Siri operates via the trustworthy Apple servers, whereas Sara has its own ideas on where data passes though. 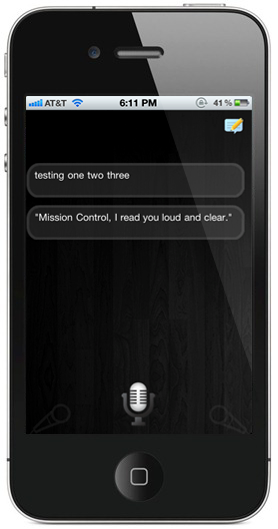 A good clone of Siri it is, but please proceed with caution. Check out this post for more information, including download links. An initialism of Experimental Speech Response Application, ESRA is a decent, free alternative to Siri for all iOS devices. Experimental does give the game away somewhat, but we reckon ESRA is something of an unpolished gem. It’s still in a developmental stage, but already looks promising. To get started with ESRA, search for it in Cydia – provided you have the BigBoss repository in your source list. If you’re unsure as to what the BigBoss repo is, then you more than likely have it, since it’s a default source on any jailbroken device. You can check out our post here for more details on ESRA. The first thing you’ll notice about Evi is that it isn’t strictly a personal assistant like Siri, but more of an information hub which can answer your burning questions – like Google, but possibly a little more convenient. It wont send SMS or remind you to call your wife when you get home, but it can manage simple calculations, currency conversions and deliver some useful knowledge upon request. The UI is beautiful, and response times are pretty darn decent. That said, if you’re looking for a proper assistant which does a little more than merely churn out excerpts locatable in a Google search, we may suggest Sara as a better alternative. Nevertheless, it costs a mere $.99 over at the App Store, and if you find yourself tempted by Evi, take a look at our feature-length post, which you can view here. It remains to be seen whether voice activation will be a mainstay in the smartphone market. Yes, Siri has sat well with consumers hitherto, but if it does manage to achieve longevity past novelty, then maybe it will become the norm for folk to engage in conversation with binary. As a precaution, please be wary of the various fake Siri clones / ports / alternatives currently doing the rounds. If you stumble across such an app or tweak, Google it, check the reviews and the stories before you go gun-ho and install it on your device to avoid any nasty surprises.